Last week, on Monday March 28, Skype reached for the first time 30 million concurrent users online. Nice number! Will it be the last “million” milestone before the Northern Hemisphere summer? Even if the answer is yes, this is already the best season ever. Indeed, since the last 2010 summer, we crossed 7 times a million milestone. The last three years there is a very clear acceleration in the growth of Skype users online. 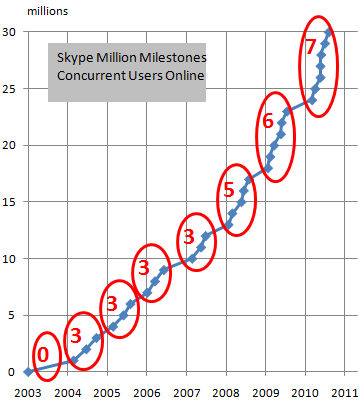 In 2003-2004 there were no million milestones (but indeed a nice steady growth of Skype users). Then, the next 4 School years, we crossed each time 3 times a million milestone. In 2008-2009, it was 5 times, and in 2009-2010 it was 6 times. So, will we stay with 7 times this year? The summer recession is approaching, and each year we have the same phenomenon: less users online at the same time. Probably people spend more time in their garden instead of in front of the computer, or they take Holidays, and some other “summer” reasons. By the way: the Skype application download counter is working again (see the RSS feed link on the right side of this blog). And why would I link your site?